A Judæo-German word meaning either to say a blessing or to bless a person. It is derived from the Latin "benedicere"; German "benedeien"; old Spanish "beneicer"; Portuguese "benzer"; Provençal "benesir," "beneir"; French "bénir." Benschen is used specifically for the saying of grace after a meal. "Gomel Benschen" means to recite the benediction of thanksgiving after having escaped a great danger either in illness or in imprisonment, or after some perilous trip by sea or through the desert, the benediction containing the word "ha-gomel"; "Blessed be thou, O Lord, who bestowest (ha-gomel) mercy upon the undeserving" (Ber. 54b). See Benediction. "Benschen" is used for the blessing of God—"Der Bore [Creator] wird dich benschen." 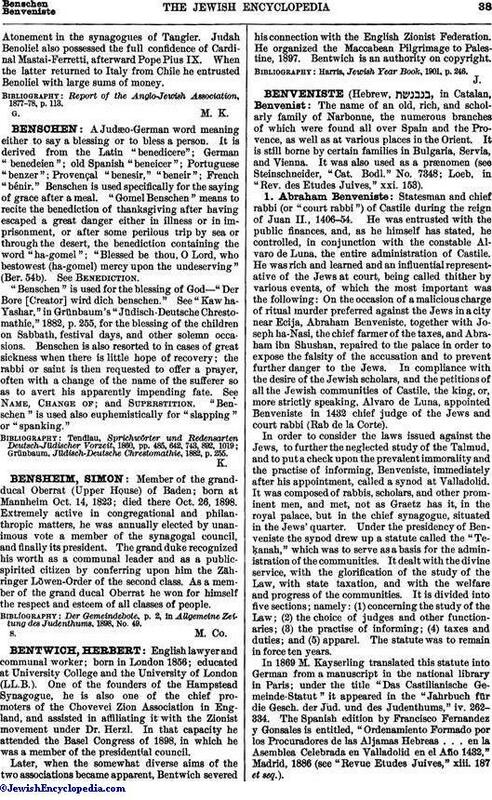 See "Kaw ha-Yashar," in Grünbaum's "Jüdisch-Deutsche Chrestomathie," 1882, p. 255, for the blessing of the children on Sabbath, festival days, and other solemn occasions. Benschen is also resorted to in cases of great sickness when there is little hope of recovery; the rabbi or saint is then requested to offer a prayer, often with a change of the name of the sufferer so as to avert his apparently impending fate. See Name, Change of; and Superstition. "Benschen" is used also euphemistically for "slapping" or "spanking." Grünbaum, Jüdisch-Deutsche Chrestomathie, 1882, p. 255.